Have you ever seen any place where the vehicle move by its own, with its ignition off??? But it’s not a magic. Due to some natural phenomena, it becomes true. Wanna experience this magnetic magic?? Then you have to go Ladakh. This place is called as the Magnetic Hill. Located in Ladakh at an elevation of 14000 feet. It is one of the wonders of Himalayan Mountain. It gives you the opportunity to be a part of this thrill and experience this mystifying phenomenon first hand. You will see the signage on that place which gives some instructions i.e. “Park your vehicle in the box marked with white paint on road and leave your car in neutral”. Just follow these instructions and your car actually starts moving on its own at speeds of 10-20 km per hour. And for those of you who are thinking ‘The movement must have been due to the downhill descent and it was just following the rules of gravity.’ Turn your car in the opposite direction and repeat the steps. It will start moving uphill. The local administration of this region has also put up a bill board marking the hill, to help tourists in recognizing the Magnetic Hill. The board clearly states the phenomenon leaving you to try this experience for yourself. Not only are the vehicles traveling on the road attracted by the magnetic powers of this hill, even the helicopters and aircrafts feel the same magnetic impact. Locals and the Indo-Tibetan Border Police (ITBP) personnel claim that the helicopters and aircrafts that pass through the area have to fly at a greater speed to avoid the magnetic impact of the Magnetic hill. And if the aircraft comes within the radius of Magnetic Hill, it starts to jerk. 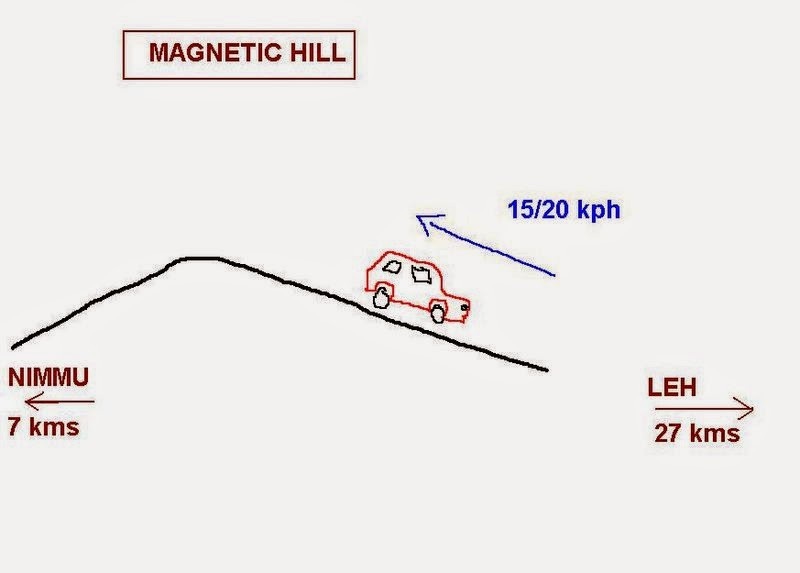 In fact, the Indian Air Force pilots always steer clear of the Magnetic Hill. 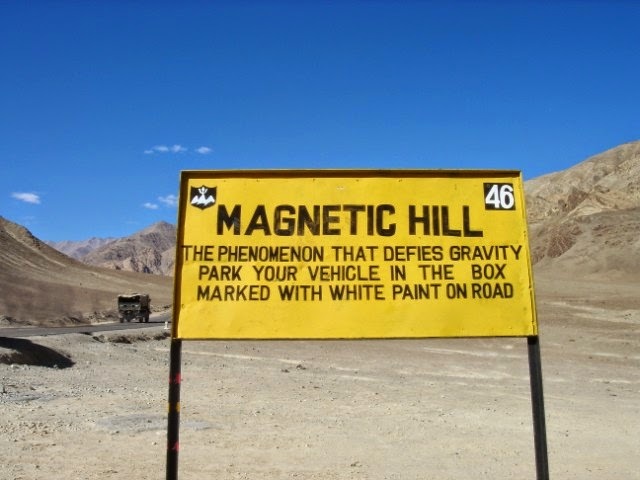 Magnetic hill is a type of gravity hill. The hill is alleged to have magnetic properties strong enough to pull cars uphill and force passing aircraft to increase their altitude in order to escape magnetic interference, while in fact, this is a purely optical effect caused by layout of the surroundings. A completely or majorly obstructed horizon is the most important factor contributing to the illusion. As, in the absence of a horizon it becomes difficult to judge the slope of a surface. If the horizon cannot be seen or is not level, then we may be fooled by objects that we expect to be vertical but that really are not. By Air: Regular scheduled flights from Delhi, Chandigarh, Jammu and Srinagar are operated to Leh by different airlines. By Road: Srinagar – Leh road (Approx. 440 km) is open for traffic from June to November is one of the oldest land route to Ladakh. Most part of the travel will be climbing mountains on this road. You can have the beautiful view of the Himalayan mountains in this trip. Jammu and Kashmir State Road Transport Corporation (J&KSRTC) operates Deluxe and Ordinary bus services between Srinagar and Leh. Taxis are also available at Srinagar. 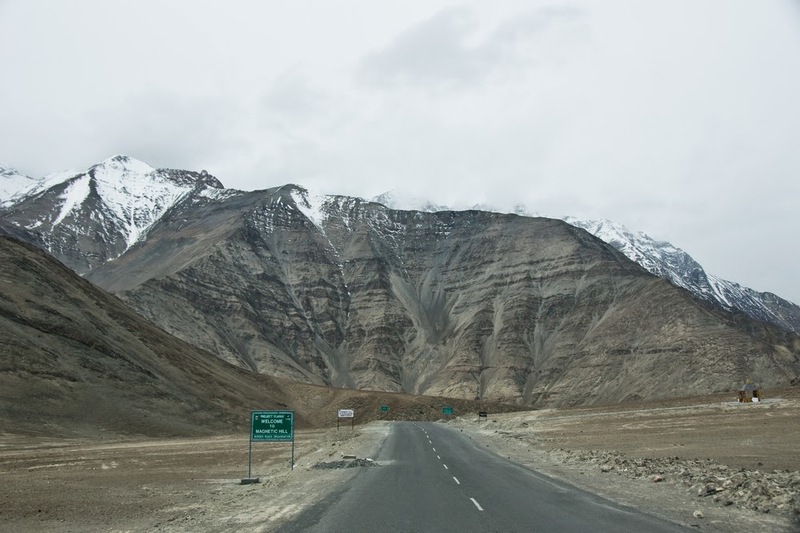 The New Manali – Leh road (Approx. 475 km) is the another land route to Ladakh. It covers the snow filled peaks of Western Himalayan Mountain and will be open from July to October, depending on weather conditions.